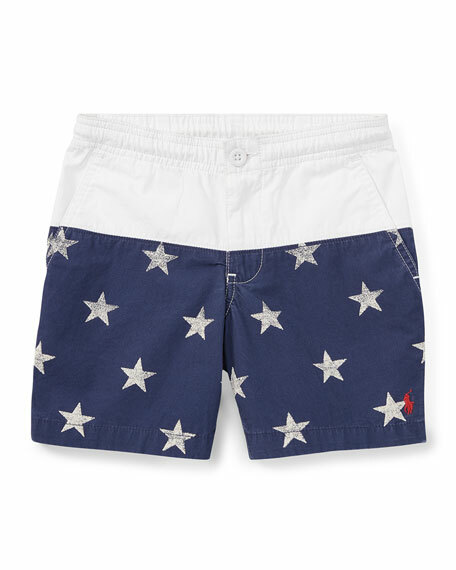 Ralph Lauren Childrenswear colorblock shorts with star-print bottom. Elasticized waistband with button detail. Side slip pockets; back button-flap pockets. AG "The Kace" boys' shorts. Striped, drawstring waistband. Side slip pockets. Back welt pockets. Straight legs. Cotton/spandex. Imported. Florence Eiseman Bermuda shorts in striped seersucker with colorful fish embroidery. Coin pocket; side slip pockets. Back button-welt pockets. Front zip; belt loops. Cotton. Imported. G-Star "Rovic" cargo shorts in graphic stripes. Side slip pockets; back flap pocket. Flap pocket at thighs. Relaxed fit; straight leg. Tab/zip front; belt loops. Cotton. Imported. Model's measurements: Height 6'1"/185cm, waist 32"/81cm, typically wears size M.
Me & Henry chambray shorts in allover fishbone print. Includes children's book about a little boy who lives in London with his dog Henry. Button/zip fly; belt loops. Drawstring waistband. Side slip pockets. Back welt pockets. Cotton/polyester. Imported.